Specialized Trail Crew? Why not? 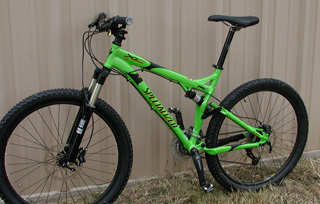 As fate would have it, the offhand comment I made in 2006 about maybe getting a mountain bike, and then my wife Anne surprising me on Christmas with a $120 Schwinn, and then… well, it’s a long story. We bought 130 acres out near Glen Rose Texas in 2000 and I proceeded to load it up with goats. We named it the Solavaca Ranch. But the darn goats will go through a fence like a bank robber through a red light. I mentioned in passing that maybe I should get a mountain bike and use it to ride the fences looking for goat-sized holes to patch. She acted on that at Christmas with the aforementioned Schwinn and I thought, uh oh, I hadn’t straddled a bike since Eisenhower. In January, 2007, when the weather warmed, I mounted that bike and took it for a test run around the grove of trees and back – about quarter mile. My legs were burning, and my rear end had already started to go numb. I got the heck off that thing. But I am a smart guy and I knew I had seen other people do this, so I decided I would stick with it for a month and see if it got better. And it finally did. Then I realized that my place was so choked with trees and brush that I would have to cut some trails before I could get around. In about 4 months I had a little single track and a lot of ranch road. By now I am not worried about the goats. I am getting into this mountain bike thing. So I invited some MTB firends out to try it. In 20 minutes, they were done. That hurt my pride. So I began the routine of building more and tougher single track, while riding my bike more and more all the time. I began to climb the un-climbable, and roll down the unthinkable. I had to have another bike. I found this Specialized FSRxc Pro at the LBS. It’s the pretty little green thing on your left there. That was November of 2007. I continued to test my trail against good riders and I kept finding out that it was not long enough, and not quite tough enough, but getting closer on both counts. Here I am ripping and hacking out climbs from the limestone hills and stubborn old cedars and the riders keep coming and making everything look easy. It hurts my pride when they do that. Using my weapons – a chain saw, axe, pick, shovel, string trimmer, and fierce determination – I made trail where nature could get at the soft underbellies of these fancy mountain bike people. I topped it off with a climb I call the Culo de Gato. Maybe you’ve heard of it. If you climb it, you can sign the wall of the barn. It’s not crowded on that wall. I’ll save you the details. But by the Spring of ’08 I had over 6 miles, mostly single track, and some challenging features. Some local club members decided to have their Spring campout on the Solavaca. Did I mention, just down the road 5 miles is another one of the best trails around – Dinosaur Valley State Park? These guys were thinking that they could get their fill at DV and then knock out the little trail at the Solavaca on Sunday. We did have a great ride at DV. 17 miles and it can get tough. Nobody but me held back. I knew what was coming. The next day we were going after the Culo de Gato. That next day was the last time anybody called the Solavaca a “beginner’s trail”. 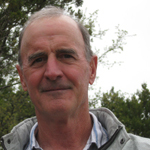 But one name went on the wall that day – Larry Colvin, President of the Fort Worth Mountain Bike Association. He kicked the Gato on his second try. I kept building and riding, taking every opportunity to introduce new friends and riders to the trail. 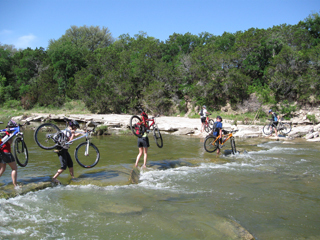 The word was getting out that there was a new and challenging trail in North Texas. In November of 2008, we hosted the North Texas XC Series for two days. We partied and pracitced on Saturday and 274 raced on Sunday. It was a spectacular success. The trail was a hit. Since then I have ridden harder and built more trail – 8.1 miles now. And we are again hosting the last race in the North Texas XC Series on November 14-15th. My family comes from near and far to help. That’s some of them on the right. Out for a day on the Solavaca Trails. My regular riding regimen is 3-5 days a week. 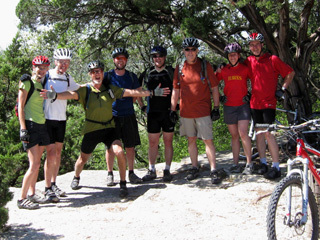 I do everything I can to encourage the sport of mountain biking in North Texas. 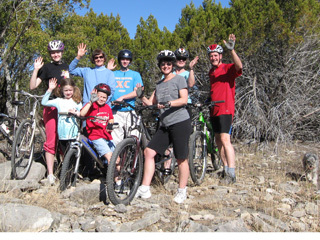 I do clinics, lead group rides, promote and represent the sport within Glen Rose, and ride with my regulars every week. For most of 2008, I struggled to make one lap of 7.5 miles. I raced the TMBRA XC event over Labor Day ’08 at Camp Eagle Texas. Now I am regularly riding 16+ miles on some technical trails. I’m branching out at every opportunity to ride more trails in the area, and soon, beyond. I am hoping you have a spot for me on the Specialized Trail Crew. http://www.specializedriders.com/blog/1/post/show/2384# I am a prolific ambassador for the sport, my trail, and I might as well be riding the coolest bike around while representing a great bike company. Nice read; good luck making the crew. If I’m ever in those parts I’ll see if I can get in on one of your rides. You are perfect for this. You have a way with people and words, plus you’ve got the biking skills & a place to use them – daily, even. I hope they pick you. They would be getting a good deal.